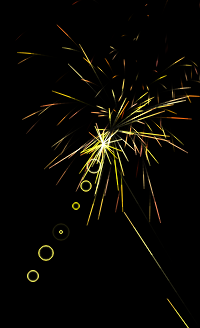 The tutorial covers keeping track of and looping over objects contained in arrays, tracking mouse clicks and coordinates, animating fireworks to specific target coordinates, and making beautiful particle explosions through the use of randomly generated values. Feel free to play with the config variables in the JS code to have fun with the experiment. Thanks! I’m trying to think how to use this in some sort of way.. Thanks..but this code will be excuted properly or where to write this code…? i want to let the text go over the fireworks help! Jack.. can i ask something? how can i play this firework inside from a table.. it seems play just in full screen windows. Cheers on the great work!! how can run these programs on my system? how can I save them? How to change number fireworks? The camera can be a very essential thing and with out life becomes very boring. happen necessarily mean that it’ll catch all crime or misbehavior done in the area. Best weatherproof cameras The rugged Pentax WG1 GPS camera offers photographic performance, innovative camera features and elegance that surpass other outdoor compact cameras. may be the same as the digital camera that is found in stores.